Coconut, pecans and caramel make a sweet sauce for a twist on German chocolate cake. For cake: Grease a 9x1-1/2-inch round cake pan; line bottom with parchment paper. Grease parchment paper; set pan aside. In a blender or food processor, combine pecans, sugar, chopped chocolate, cocoa powder, baking powder and baking soda, pulsing until nuts are ground. Add eggs and vanilla. Blend or process till nearly smooth. Spread nut mixture in the prepared pan. Bake in a 350 degrees oven about 30 minutes or till a toothpick inserted near center of cake comes out clean. To serve, cut into wedges and place on dessert plates. 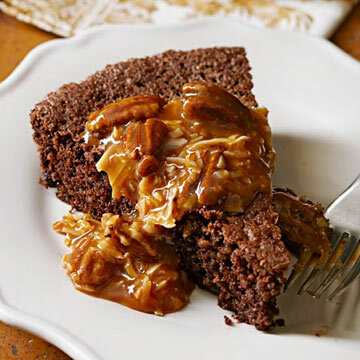 Drizzle with Toasted Coconut-Pecan Caramel Sauce. Spread coconut and pecans in a thin layer in a shallow baking pan. Bake in a 350 degrees oven for 6 to 8 minutes or till the coconut is toasted and the nuts are golden brown, stirring once or twice. Remove from oven. In a medium bowl, stir together caramel ice cream topping, coconut and pecans. Serve immediately or warm slightly in microwave before serving. Makes about 1-1/2 cups. Is this truly a no flour cake? Midwest Living here—you are correct; this is a no-flour cake!